After testing we have used this HD Underwater housing down to a depth of 60 Meters. Malcolm spent his early years as a snorkel diver, purchasing his first scuba set in 1968. As a recreational diver, he worked at Divers Service in Adelaide, South Australia, maintaining their diving equipment and assisting their dive instructors. In 1969 he became a founding member of the original South Australian branch of The British Sub Aqua Club and their diving safety officer. 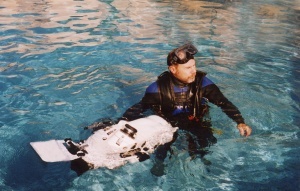 He also embarked on a career as a professional cameraman and diver for Marine Industries, Aqua Salve and SA Marine Pty Ltd. His work with these companies involved submarine pipeline installation, underwater cutting, under ship maintenance, slipway construction, salvage operations and use of a variety of underwater cameras, airlifts and pneumatic underwater tools. In 1973 he completed a Federation of Australian Underwater Instructors certificate and in the same year joined J R McDermott Ltd where he was employed as a mixed gas diver on Australia's North West Shelf oil field on the "Ocean Digger" and "Big John" oilrigs. His work there included underwater photography and submarine maintenance and repair of blow out preventer stacks to a depth of 200 meters, using mixed gas diving techniques and operating an assortment of sophisticated submersibles, diving bells and recompression chambers. In 1975 he returned to Adelaide joining Port Stanvac Marine Ltd as a commercial diver cameraman and coxswain. At this time he was jointly responsible for boat operations, sub-marine maintenance and underwater inspections and installations at Adelaide's deep water oil refinery and was commissioned to produce inspection films and do photograph at this facility. In 1976 along with some associates, he was instrumental in the formation of Adelaide's Southern Skin Diving Centre and conducted a complete FAUI diver training programme for this new venture during the next few years. In the same year he received his certification as a Cave Diver. Since 1977 most of his underwater work has predominantly involved specialised underwater cinematography using 65mm IMAX film, 35mm and 16mm motion picture cameras and now the new generation HD broadcast video production cameras and digital stills photography equipment. In 1979 Malcolm formed his own production company Sea Films Pty Ltd which has become a leading provider of underwater camera technicians and expertise to the film and television industry in Australia. He has been the underwater Director of Photography on numerous documentaries, commercials and feature film productions throughout the world. Projects include over 20 Great White Shark filming expeditions, several diving action adventure series, Whale Shark, Southern Right Whale, Octopus, Seahorse and Manta Ray films to name a few. Other diving ventures include three under-ice diving expeditions to Antarctica where he filmed the ABC wildlife series "The Nature of Australia" and the internationally renowned 70mm IMAX film "Antarctica". During this production he completed more than 70 dives under sea ice and recorded never before seen images, inside the Chaos glacier. Other underwater film projects include a six-part series on Europe's largest commercial diving school at Fort Bovisand Plymouth, covering all aspects of the rigid preparation and training of professional divers for the offshore oil industry: two High Definition television documentaries on shipwrecks and an extraordinary film on the Sea Snakes of Niue. Currently he holds the Department of Labour & Industry log book (number 28), Commonwealth of Australian Diver accreditation certificate (AS2815 Part 2) Number 1035, FAUI advanced diver certification Number JF4315, and Technical Diving International Nitrox diver certificate Number 2822. He has a current oxygen administration and first aid certificates and a current dive medical certificate. Malcolm is also a member of the Underwater Visual Producer's Association of Australia. This two person submarine was as used during the filming of series 1 of "Shipwreck Detectives"
Working at sea filming Great White Sharks in action.